Alexandria, Egypt’s ancient metropolis, has become the artistic and cultural centre of the country. A place of former glory the remaining historic sights that are a must-visit include the Alexandria Museum and Bibliotecha Alexandria. This is a city which has a young and energetic feel. Our collection of the best places to stay in Alexandria are luxury destinations, perfect for a little indulgence. Alexandria was once Egypt's capital and home to Cleopatra and Alexander the Great. Many of its monuments, the Pharos Lighthouse, and the Great Library, have since been swallowed (literally) by the sea and Nasser's nationalism in the 1960s. Very much a city in transition there is a growing youth culture of artists and writers. Expect to find lots of old word cafes, museums, monuments, and excellent fish restaurants serving fresh catches of the day. You will find that the best places to stay in Alexandria are luxury hotels which still retain elements of the city's past. Culture-vultures are spoilt for choice in Alexandria. In terms of museums, you need to visit the Bibliotheca Alexandra, the Royal Jewelry Museum, and the Alexandria National Museum. If you like a good historical site then the imposing,15th-century Fort Quaitbey is a must-see. The fascinating 2nd-century Catacombs of Kom el Shoqafa is another fascinating spot. Wander around the lovely gardens of Montazah Palace, home to King Faruk, the last Egyptian monarch. Sofitel Cecil Alexandria - old world charm and romance. 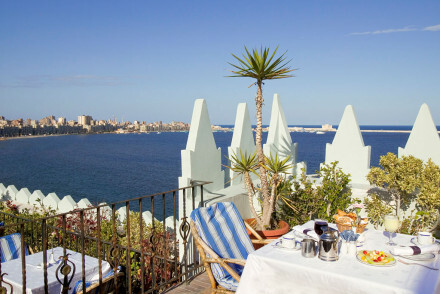 A classical facade with grand interiors, an excellent French restaurant, on the sea's edge. 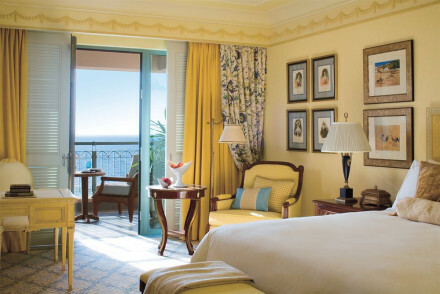 Four Seasons Hotel Alexandria At San Stefano - the gorgeous boutique suites are very romantic. There's a top of the range spa, infinity pool and sea views. The excellent Lebanese and Italian cuisine are a real highlight. The best time to visit Alexandria is from May to June or September to November when the average temperature is around 20-25°C. It's incredibly humid and busy during the summer so you might want to avoid coming at this time. Fly into Borg El Arab Airport, located about 25 miles southwest of the city, before taking a bus or a taxi to the centre. Alternatively, you can hire a car with Rentalcars. Browse through our entire list of the best places to stay in Alexandria. Widen the net to include all our recommendations in Egypt. If you're still stuck, contact one of our friendly gurus for advice. An historic hotel with a classical facade and grand interiors. Old world romance and charm throughout. Rooms and suites have floor to ceiling windows, rich fabrics, antique furniture, and balconies with sea views. Two excellent restaurants. A romantic spot to explore Alexandria from. Sights nearby - St. Mark's Coptic Cathedral, Bibliotheca Alexandrina, Alexandria Stadium, Qaitbay Fortress and Pompey's Pillar. A luxury Five Star hotel with boutique flair and an intimate atmosphere. Gorgeous suites, all individually decorated, mix tradition and modern comfort to stylish effect. Excellent Italian and Lebanese restaurants, top of the range cardio gym and spa, infinity pool with sea views. A stand out hotel. Foodies - Italian and Lebanese restaurants. Sights nearby - Roman Amphitheatre.